The whole front is divided into 5.25" bays. 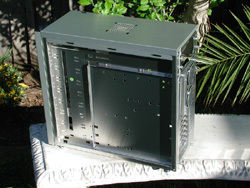 In most tower cases there is a proprietary area at the lower front, usually with a fan mount, perhaps some drive bays, but fixed to the case. In the PC-6077 you can move the lower fan mount, with associated front-mount ports, power button and LEDs etc, up higher if you prefer. Put that block at the top, your CDROM drive at the bottom and your floppy drive in the middle if you like. This flexibility is great for watercooling because it removes that dead space at the lower front and lets you fit your reservoir, pump or radiator there. Remove the floppy drive space entirely if you don't use one. 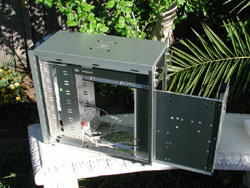 If you wanted to go to the trouble of relocating the power switch, you could even remove that entire block, fully populate the front of the case with 7 CD drives and make yourself an archive tower. Because you can move this block up and down to your preference, there are no support tabs in the 5.25" bays - they would foul the block because it spans two bays. This can make mounting drives a little fiddly, but I think it's a fair tradeoff for the flexibility this system gives you. It actually simplifies the internal layout quite a lot, which makes working with the insides easier. Lian Li have been careful to roll all the sharp edges and cover with plastic the upper section that they couldn't roll. However, the back of the drive bays is still fairly sharp and could cut you if you did manage to bang your hand into it. 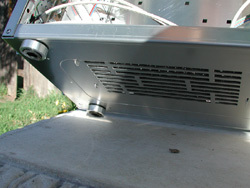 At the bottom of the case is an unusual vent. Even with the nice aluminium feet provided with the case, this vent is less than an inch off the ground, so this is a prime spot to be sucking dust into your case. Lian Li therefore include a dust filter in this space. Given that there are two exhaust fans and only one intake - they all seem to be identical models - there will be slightly lower pressure inside the case and this vent will allow that to be equalised without drawing too much dust into the unit. There doesn't seem to be any way to mount a fan onto this vent, which is probably a good thing. 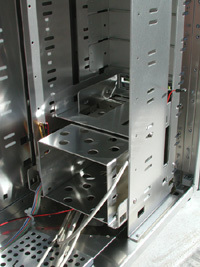 Inside the rear of the case we can see the two 80mm fan mounts, one with fan installed. It even has a nice aluminium finger guard. The card slot covers are all secured with thumbscrews which is handy. Looking inside the front of the case shows how the lower block of intake fan, power switch and LEDs etc is screwed into the lower two 5.25" bays like a normal device. Unscrewing it lets you move it up to whichever bays takes your fancy. 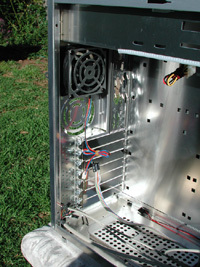 Note also that behind the intake fan are three 3.5" drive bays, to house and cool your hard drives. Above that is the 5.25" adapter for the floppy. This masks the front of your floppy drive with an opening that matches the rest of the case. This kind of thing is pretty common in cases nowadays and works surprisingly well. If you don't use a floppy drive you can remove this adapter bay or just the floppy-drive faceplate. 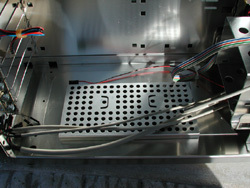 With the other side panel removed, you get access to the other side of the drive bays and you can see the removable motherboard tray. 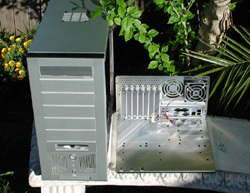 Note that you don't need to remove the side panel to remove the motherboard tray. 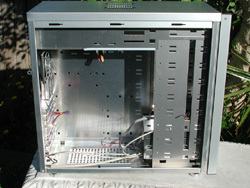 A few thumbscrews on the back of the case is all that you need to remove, then you can slide it out. I'm a big fan of removable motherboard trays but they aren't too common nowadays. I guess they add complexity, weight and cost to a case, but if you change motherboards occasionally they make life much easier. Given that you will no doubt be keeping a case like this for a long time, chances are you will upgrade your motherboard a few times during its life.